How much is Elon Musk worth to Tesla? Is he a visionary who is truly instrumental to the company’s ambitious plans, or could his job be done by any old Silicon Valley type who looks becoming in a blazer and jeans? At least two of Tesla’s largest shareholders feel strongly about the former, and that’s why they are backing a compensation package for Musk valued at $2.6 billion. If that sounds like a lot, it’s because it is—but it’s also dependent on Tesla meeting some extremely aggressive targets. Baillie Gifford & Co. and T. Rowe Price Group Inc., which combined own about 14 percent of Tesla stock, indicated to Bloomberg News that they’ll vote in favor of the board’s proposal at a March 21 special meeting. The unprecedented pay package has been criticized as too costly by proxy adviser Glass Lewis & Co., which has recommended that investors reject the plan. While it would likely have slim chances of getting passed elsewhere, Tesla isn’t a typical company, and Musk isn’t a conventional chief executive officer. The proposed award, resembling one Musk received in 2012, consists of 20.3 million stock options that will vest in 12 increments if market-value thresholds and other financial targets are met. Each tranche equals about 1 percent of Tesla’s outstanding shares. The company’s market value has to reach $650 billion for the award to fully vest — roughly a 12-fold increase. 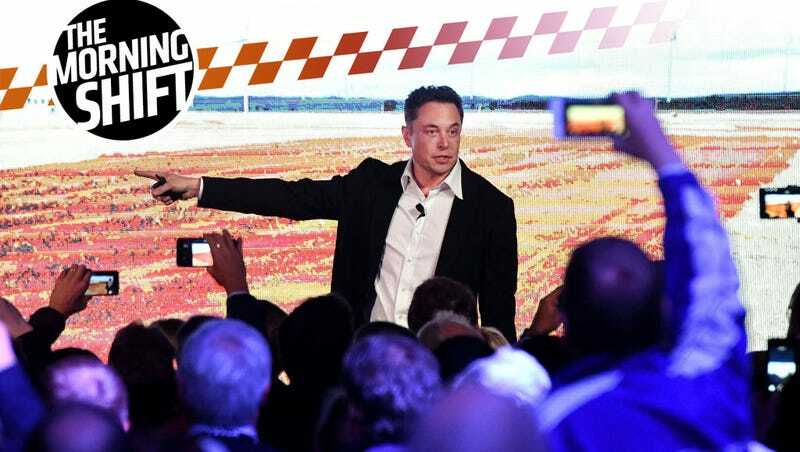 “The only reason why Tesla is successful is because of this guy,” he said. As automakers such as Mercedes-Benz and BMW prepare for an age of zero emissions, it’s the flashy coupes and gas guzzlers in their lineups that that will help fund the way. At the Geneva auto show this week, BMW unveiled the high-performance M8 Gran Coupe concept, and Mercedes-Benz showcased the AMG GT four-door coupe, sporting a V-8 engine that emits more than twice the amount of carbon dioxide allowed under European Union fleet rules that come into force in 2021. The irony is it’s these old-school models that generate the money needed to meet tighter environmental standards. That’s prompting the German brands to squeeze into the small, but lucrative segment of luxury four-door sports cruisers, with the Porsche Panamera and Audi A7. With price tags that can easily surpass $100,000, the cars remain out of reach for most consumers. Even at the risk of cannibalizing one another, the lure of easy cash is hard to pass up at a time when spending pressure is mounting. Basically, these four-door coupes are easy money because they’re so premium and expensive, even if they share engines and platforms with “lesser” models. Those margins help fund R&D for future tech like EVs and hybrids. Whatever works. It’s still better than more dumb crossovers. The extremely contentious planned steel and aluminum tariffs devised by President Trump are expected to be formally ordered today, though the latest development is that these tariffs could exclude Canada and Mexico for “national security reasons.” They will lose that exemption if they don’t sign off an an updated NAFTA agreement, Bloomberg reports. Said tariffs would inevitably drive up the price of cars, which is why they’ve been slammed by the auto industry, economists and leaders within Trump’s own party. The U.S. may exempt countries from the duties based on national security considerations, White House Press Secretary Sarah Huckabee Sanders said Wednesday. She didn’t comment on how those determinations would be made and or which countries would qualify. Negotiators from the U.S., Canada and Mexico wrapped up the seventh round of NAFTA talks this week in Mexico still hoping for a breakthrough on the biggest sticking points. The president hinted at the tariff incentive in a tweet earlier this week, without elaborating on how the trade-off would work. Trump has said he’s determined to impose a 25 percent tariff on steel imports and 10 percent on aluminum to protect national security. The plan has been widely criticized by Republicans, panned by corporate America, shaken global financial markets, and prompted the resignation of Trump’s top economic adviser, Gary Cohn, this week. This is going to be just fine! GM Chairman and CEO Mary Barra, in a speech Wednesday at the CERAWeek energy conference in Houston, cited surging global demand as driving the decision to boost production of the Bolt, an extended-range plug-in electric vehicle. It’s not clear if the production boost would lead to any additional jobs. GM employs 1,148 workers — 1,005 hourly and 143 salaried — at Orion Assembly. Barra noted the increasing numbers of miles driven in GM’s electric vehicles. “In December 2012, the Chevrolet Volt was GM’s flagship electrified vehicle and its owners hit a milestone 100 million all-electric miles just two years after it went on sale. By December 2017, drivers of five electrified models, including the Bolt EV, racked up more than 2.6 billion EV miles,” her speech said. “We are encouraged by this momentum, and because of increasing global demand for the Chevrolet Bolt EV, we are announcing today that we will increase Bolt EV production later this year at our Orion Assembly plant north of Detroit,” according to prepared remarks. Barra’s speech also urged an expansion of tax credits for electric vehicles, and she said more must be done to boost the nation’s electric-vehicle charging infrastructure. Limited public charging options is one of the reasons often cited for so-called range anxiety, an expression that describes the worry that an electric vehicle will not be able to get to its destination. Here’s the most European take on ride-hailing services yet: if you summoned an Uber or Lyft, would you take it if the driver showed up on a scooter? That’s what BMW is mulling at the moment, but they are concerned how to solve the helmet issue. BMW AG would like to start offering up the back seat on motorbikes and scooters to get around congested cities — if the issue of helmets can be solved. BMW already offers car sharing via its DriveNow brand, where customers can rent vehicles like the Mini Countryman by the minute. As a first step to bring motorcycles to a broader audience, the Munich-based carmaker will start a pilot in May allowing people to rent motorbikes via an app from dealers for a few days at a time, starting in Germany, France and Austria. The potential broadening of services is a step in a plan to triple BMW’s customer base to 100 million users by 2025.